Money Actions and Free Money are an ongoing series of situations in which I give away money in various settings, exploring the interactions and experiences that result. I’ll be at Open Engagement in Portland, Oregon May 18-21 with a new project, The Emancipation of Money. 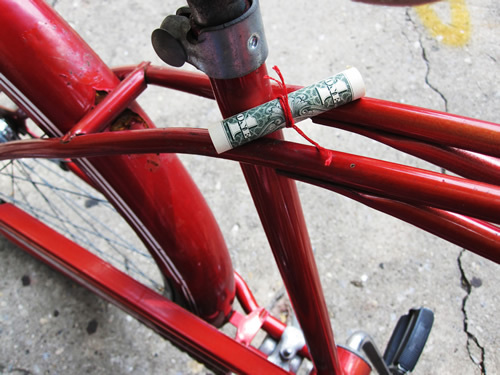 The Emancipation of Money is an experiment in circulating an alternative form of currency (the Free Dollar) among the participants of Open Engagement. 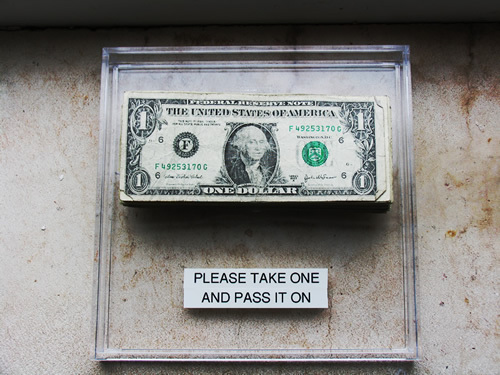 With no predetermined purpose or use, the Free Dollar is designed to invite questions and provoke interactions. 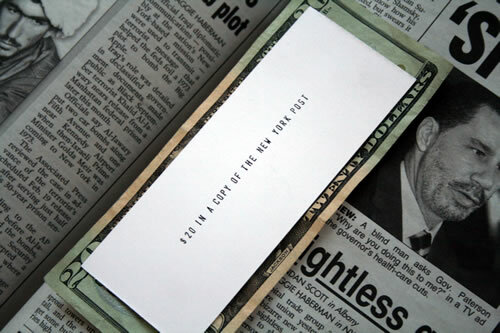 Hand printed “dollars” will be infiltrated into the social community in a number of ways: left for the taking on open plates, given in spontaneous acts of admiration or amusement, slipped into publications and papers, or offered on request. The Free Dollar intentionally has no specific use. It has no denomination, no conventional value. It is not, like the Ithaca Dollar, the notes of the historic Cincinnati Time Store, or the currency of the recent Time Bank, meant to represent labor. It is closer in spirt to children’s play money, but unlike video game gold or monopoly cash which transmute effort, skill or luck into value, the Free Dollar is untethered to any particular form of reward. 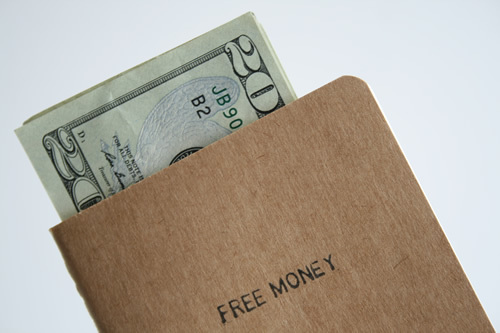 Free Dollars, like any kind of money, can be given, stolen, asked for or accumulated. They are peculiar in that they most likely cannot be spent. The Emancipation of Money asks: What can happen to money in the absence of that familiar act of spending? 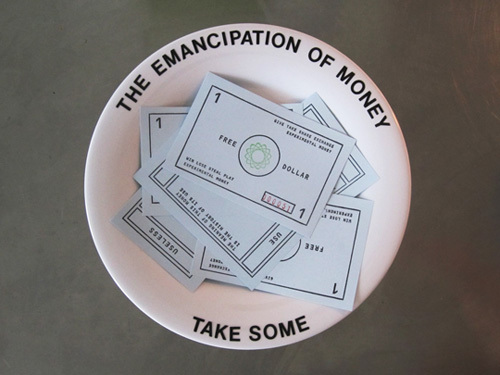 The Emancipation of Money is part of an ongoing series of Money Actions in which Randolph has been using the social dimensions of money as the basis of an interactional and interventionist art practice. For the past several years she has given away (real) money in streets, stores, galleries, cafés, at talks, at dinners, over coffee, sometimes anonymously, sometimes in groups or person to person. 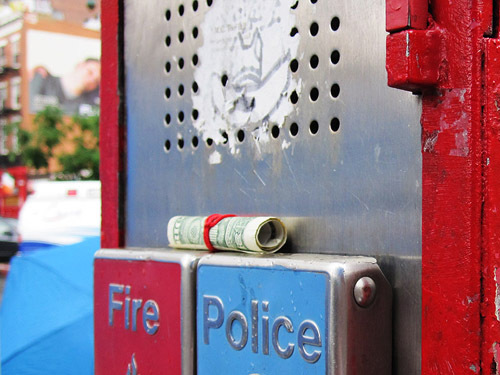 Because money is caged in rules, simply acting outside these rules opens up new ranges of social action and interaction. This project for Open Engagement extends Money Actions beyond the real, into realms of play and invention. It is hoped that a purposeless form of money might offer a means of critically engaging the purposes of real money. NOTE: If you have free dollars with a history written on them, you're encouraged to photograph them, scan them, or send them in to the project archives - contact me at salrandolph [at] gmail [dot] com for details. 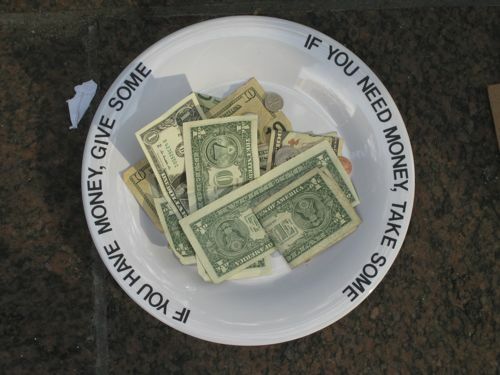 If You Need Money, Take Some. If You Have Money, Give Some. 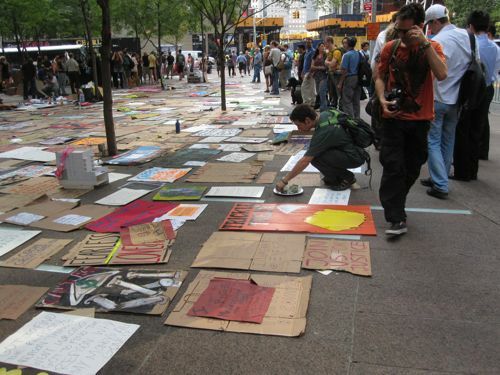 Street actions currently taking place in New York and elsewhere. 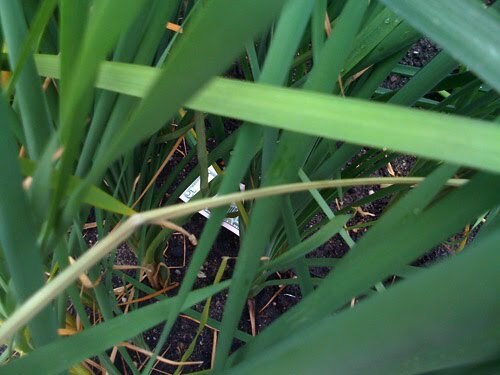 I’m excited to report that two Money Actions will be part of the 29th Ljubljana Biennial, opening September 23, 2011. 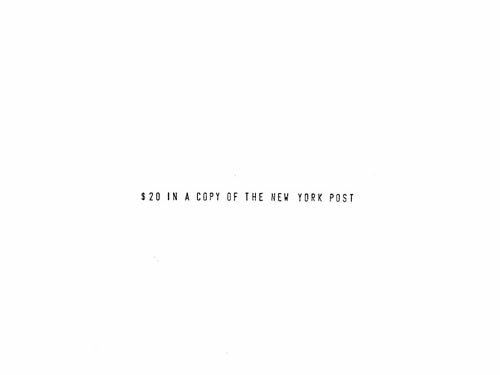 On view will be documentation from “$1 Near Something Red” and “100 Money Actions for 14th Street. A live money action will take place in Ljubljana in November (date forthcoming). Meet with me, and you will receive a sum of money and a choice. A number of Free Money appointments will be available in New York over the course of the spring. If you’ll be in New York, and have an hour free to meet up with me in a café, contact me at salrandolph [at] gmail [dot] com to set up a time. Money actions on and around 14th street throughout the month of October 2009. Follow current Money Action updates on Twitter twitter.com/moneyactions. 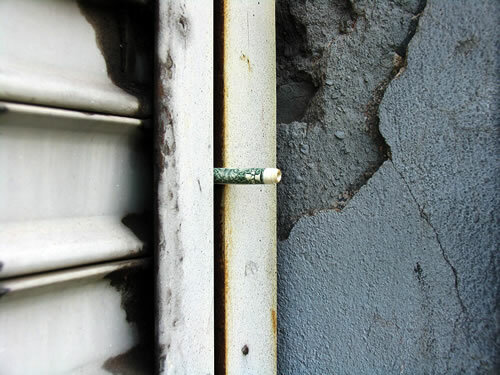 February 12, 2009: I placed $1 bills at eye level along Canal Street and throughout lower Soho. Each rolled bill had a hand stamped print inside, bearing the words “$1 Left at Eye Level.” An additional set of bills & prints was handed out to vistors at Glowlab with the request that they be left anyplace in public at eye level. 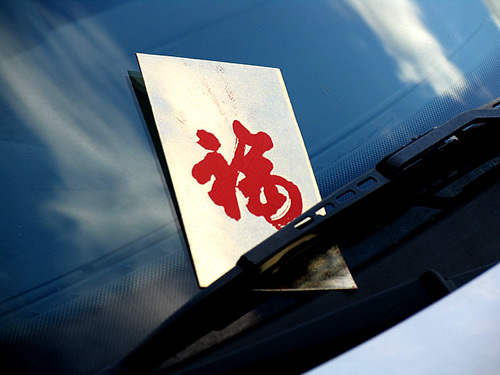 Language documenting money actions. Unique rubber stamp prints & various other forms. 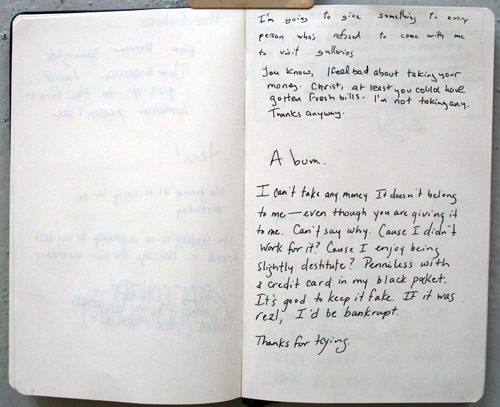 As part of the Live Biennale in Vancouver (2007), I met with 22 people one on one in Vancouver cafés. I gave each person $50 (Canadian) and asked them to make a choice as to whether they would keep the money or give it away to someone else. During the meetings, which lasted about a half hour each, I had a remarkable series of conversations about money, work, art, and life. Free Money was presented as part of the Participatory Dissent program at Western Front, curated by Natalie Loveless (invited by iKatun). Please take one and pass it on. 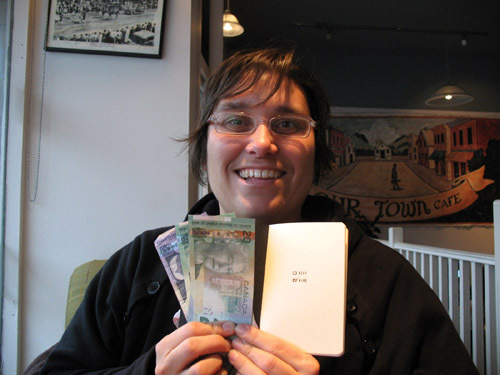 A Free Money happening, Free Money Release was part of the Conflux Festival in September of 2006. 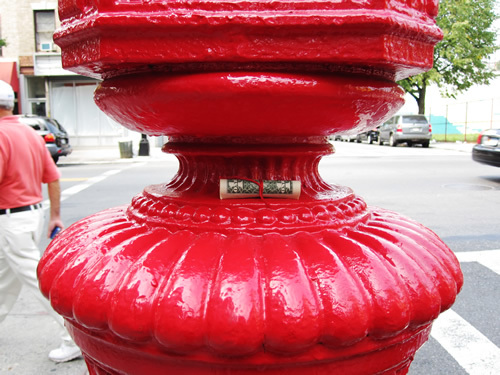 During the Conflux, $1000 was distributed in the public spaces of Williamsburg in shiny gold envelopes for anyone to find. 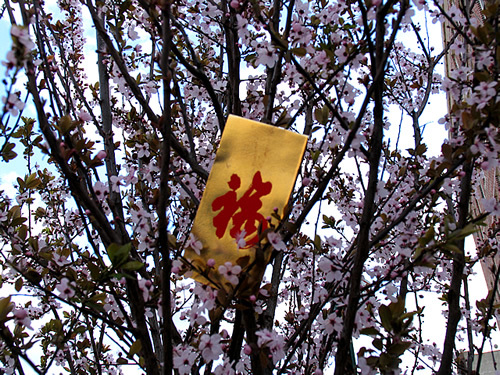 Participants from the first Free Money found places for the envelopes throughout the neighborhood in cafés, supermarket shelves, subway corridors, the public library, and telephone booths. The first Free Money event was held during be something’s one2one festival of intimate performances. During that event, the artist met with eleven people tête à tête in a Wiliamsburg café. Each participant was offered a choice between $20 to keep, and $100 to give away to someone else—a total of $1,020 was distributed over the course of the afternoon.